Hearing is Believing. 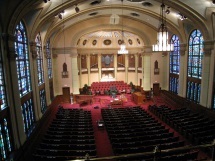 Our Acousticians and Acoustical Engineers are nationally respected authorities on acoustical environments for churches of all sizes, shapes, and denominations. No two congregations are identical; our advanced acoustical modeling software allows us to strategically place sound-reflection, absorption, and diffusion features in quantities and locations that support and enhance the specific worship style of each church. Every project is acoustically tested and verified to ensure a successful outcome. As we are not the representatives of any acoustical material manufacturer, sound system equipment supplier, or building contractor, we are able to consult and advise in an objective manner with only the best interests of our clients in mind. We are faithful to one goal: creating an acoustic environment that enlivens worship through the dynamic expression of speech and music. Reverberation Time across frequency spectrum. 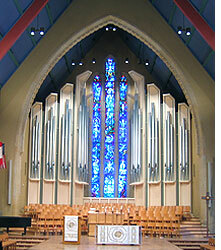 The sanctuary at South Main Baptist Church is visually rich in artistic symbolism and architectural beauty. Biblical imagery is expressed in the design details of the room, and the glorious stained-glass windows bathe the space in color and light. 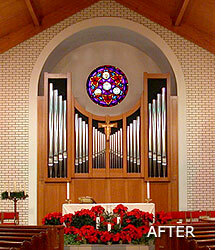 The church's previous organ façade and case did not match the architectural integrity of the room. Acoustic conditions were difficult and dull. 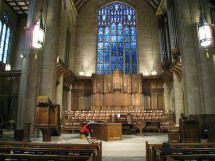 Large amounts of carpeting, and restrictive organ chamber tone openings, along with limited and inflexible Chancel and Choir space, resulted in poorly blended and projected tone, and suppressed congregational participation in sung and spoken parts of the service. 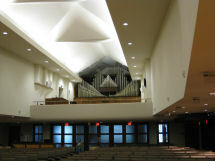 The concave ceiling geometric form caused acoustic "hot-spots" in the otherwise "dead" acoustic environment. The acoustic re-design of the room included removing all carpeting and creating and restoring hard wood flooring throughout the space. Sound absorbing materials were installed within under-floor cavities to suppress foot fall noise. 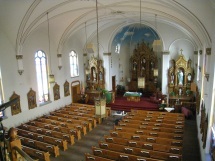 The Chancel and Choir areas were enlarged to created adequate and flexible space for liturgy and for choirs and instruments. Discrete sound diffusing features were added to some walls, and modest amounts of sound absorbing plaster were added to strategic portions of the ceiling for the purpose of eliminating unwanted echoes and "hot spot" sound focusing. 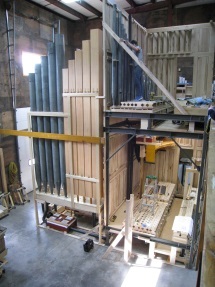 The organ chambers were re-configured, and finished in multiple layers of hard, dense gypsum board in order to reinforce the full range of pipe tone. 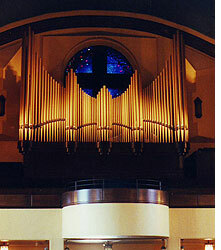 Organ cases and facades, commensurate with the architectural style of the room, and complementary to the entirely new organ, were created by the Nichols & Simpson Organ Company. The organ blower room and air circulation system within the organ chambers received noise attenuating acoustic treatments. Now the vibrant sounds of organ, instruments, choir, spoken word, and congregational participation in hymns and liturgy match the inspiring architectural setting. 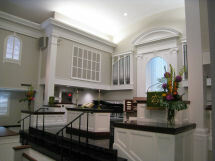 The mid-century contemporary styled worship space at Vanderbilt Presbyterian Church is octagonal in form. The pre-renovation space had carpeted flooring, a partially sound absorbing wood deck ceiling, and poor sound diffusion and some focusing due to the geometric form of the space. Choir singers and instrumentalists had difficulty hearing each other in the Chancel space, and the tall open tower above choir and organ caused both sound trapping and unwanted echo type reflections. 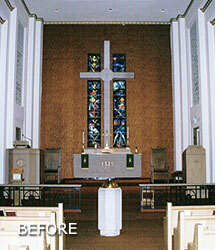 Acoustic renovations included changing carpeted floors to all sound reflective hard surface materials. 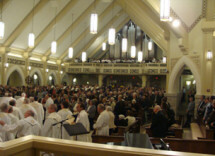 Now the congregation can hear each other and participate well together in hymns and liturgy. Musicians also hear each other well for ensemble building, and carpets no longer absorb sound energy in spaces between the Chancel and listeners in the nave. The reverberation period in the room was significantly increased. 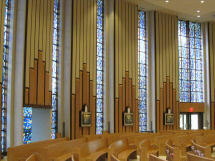 Nave side walls have been detailed with architectural features that diffuse and distribute sound energy. The ceiling has also been re-configured to reflect and diffuse sound so that listeners receive blending and reinforced sound energy. Modest amounts of sound absorbing materials were applied on the ceiling deck of the open tower above choir and organ to prevent unwanted echo and focused reflections. The new and elegant Lively & Fulcher encased organ, on the center-front long axis of the room, now blends its tone into a cohesive chorus ensemble, with colorful solo stops offering an array of musical possibilities. 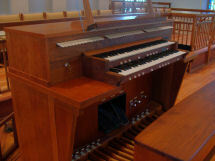 The hard-wood lower organ case also serves as a diffusive "sounding board" for choir singers seated forward of the organ. Since the Chancel floor area has been reduced in height and laterally enlarged, proximities and musical presentations are more intimate, while also having greater flexibility for musical and liturgical use. 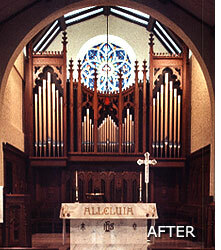 Before the renovation of this worship space, the room's interior included fully carpeted nave flooring, carpeted choir riser flooring, and a bright neo-Baroque style organ located on the front wall of the Chancel. Conditions were poor for congregational participation in hymnody and sung and spoken parts of the service. Choir singers had considerable difficulty in hearing each other. Further, music did not project evenly or fully from the Chancel into the nave, and flutter echoes were audible in the Chancel due to the flat ceiling plane. 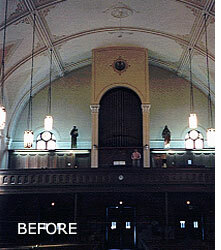 Acoustic improvements included the installation of hard surface flooring throughout the room, and the introduction of sound reflective and diffusing architectural features in the Chancel (frame and panel walls with a coffered ceiling). Modest sound absorbers were added to the front face of the rear balcony to clarify speech, by preventing echo type sound reflections. The result is now an increased reverberation period and "liveliness" in the room. There is vibrant participation by the congregation in hymns and liturgy, and choir and instrumentalists can hear each other as well as be heard throughout the nave. 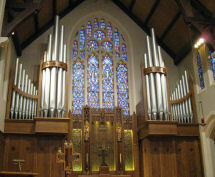 The new Schoenstein organ, located in side chambers flanking the Chancel, with pedal pipes hidden at the front wall, is scaled and voiced in the orchestral/romantic English/Scottish tradition, with tone that blends together and enwraps the listener. 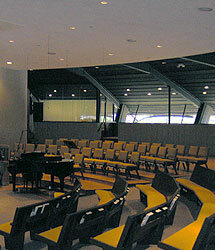 The Community Church worship space is a "fan shaped" auditorium type room. 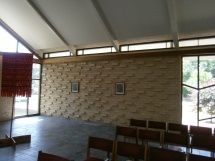 Originally, congregation area floors were carpeted, and the rear perimeter walls were primarily clad in sound absorbing cloth covered fiber-glass acoustic panels. 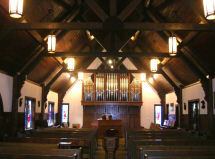 The ceiling was made of coffered plaster, and choir and organ were located to the upper left of the Chancel platform. 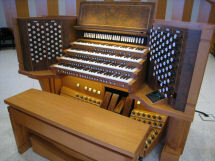 The former organ was a neo-baroque mechanical action instrument. The low reverberation period in the space did not enhance choral and organ music, nor did it foster good congregational participation in hymns and sung or spoken liturgy. 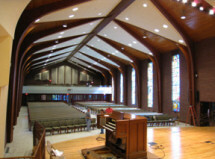 The expanded music program of the church required additional and flexible choir seating to accommodate the wide shift between "high" and "low" seasonal attendance. Further, a larger organ, romantically conceived, but capable of setting forth a wide range of compositional styles and eras, was desired. The sound system was aging, and designed to accommodate the room's low reverberation period. 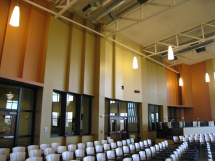 Acoustic improvements to the room include primarily hard surface flooring, with carpet only in select aisles, and sound reflective walls featuring hard, dense construction and uniquely engineered sound diffusing surface profiles. Retractable curtains are installed at the rear of the room to adjust the reverberation period for the high and low seasonal attendance shifts. Ceiling surfaces were hardened and sealed. The reverberation period is now at 2.0 Seconds. 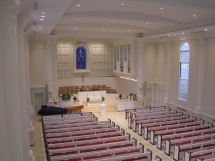 The new sound system features an array of ceiling mounted speakers, along with special coverage speakers installed within the chancel steps, and monitor speakers to serve those seated at the Chancel and Choir. The system also includes comprehensive sound, video, and recording applications and controls to serve worship, theatrical productions and concerts. 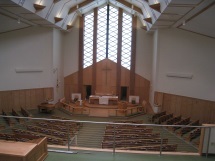 Christ Presbyterian Church is a 1980's Contemporary Style building situated on the shore of Lake Mendota in the state's Capitol City. Both traditional and contemporary music styles, along with a variety of theatrical and musical productions are all presented in the room. 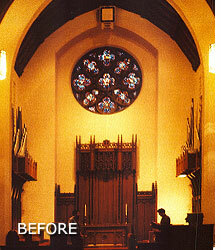 The worship space's original acoustic challenges included a too low reverberation period that did not enhance music or support congregational sung and spoken participation in the service. Carpeted floor areas, along with the presence of flutter echoes and excessive HVAC background noise, further diminished the acoustic environment. 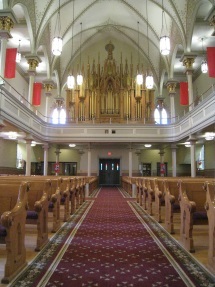 The church's heritage Möller organ is located in the rear gallery, with an Antiphonal division at the front of the space, above and behind the Chancel. The tone of the Antiphonal division was severely obstructed by dense tone grille fabrics and other sound trapping building features. Acoustic renovation design elements include increasing the amount of hard surface floor areas, the use of sound reflective/diffusing nave side-wall profiles, and the application of sound absorbing material to the rear balcony face. 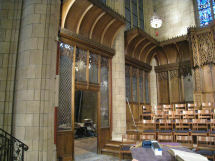 The front Reredos wall of the Chancel has been reconfigured to allow Antiphonal organ tone to project to the nave without obstruction, and the carefully angled and partially sound absorbing flanking walls of the chancel serve to project and balance contemporary and traditional music. The HVAC system was altered to reduce air speed and attenuate noise. The new digital audio system allows easy transition from contemporary to traditional service styles, and employs a line array speaker system with a hidden subwoofer. 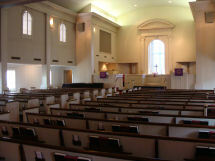 An indicative loop hearing assistance system and video projection onto Chancel walls complete the A/V package. Slinger, Wisconsin (originally called Schleisingerville before 1920) was a small town in the rural hills of southeastern Wisconsin. Today it is a growing commuter suburb of the Milwaukee metropolitan area. 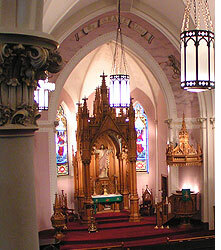 St. Peter's Catholic Church is an 1800's gothic style structure with a classic tall steeple, a handsome set of wood carved furnishings, and a fifteen rank pipe organ in the rear gallery that was built by the Schaefer Company of Slinger. 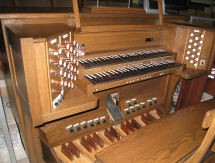 It has been modified over the years with a new electrical system, console, and pipe alterations. 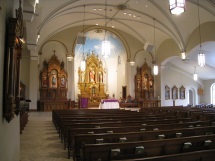 By 2016 the Parish had out-grown the 360 seat worship space, and decided to enlarge the current building to over 600 seats, while maintaining their historic architecture and furnishings. The structure was expanded by with large transepts added to both sides of the nave. Acoustic features include new matching hard plaster walls and vaulted ceilings, and all hard surface flooring, resulting in an average of 2.8 Seconds Reverberation Period. Discrete sound absorbing treatments are disguised within two ceiling bays to prevent echoes. The wood and glass walls at the rear of the nave are canted with wood frame detailing to prevent echo reflections and to diffuse sound energy. 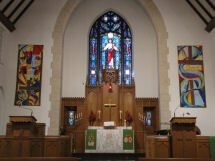 St. Mark's Lutheran Church is a congregation that offers a wide variety of worship opportunities and styles. 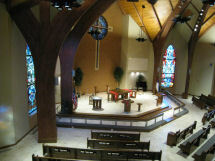 As the project began, the church had one worship space in which they were conducting Traditional, Blended, Contemporary and "High Impact" services. 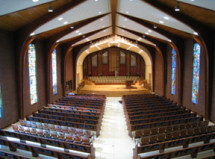 The room contained theater style stadium seating, large areas of carpeted flooring, sound absorbing wall panels and curtains, video screens, and a mechanical action organ that had been moved from the congregation's former church building. Though the effort was made via architectural detailing and A/V system design to meet the needs of the varying worship and music styles, the room met the needs of none well. The new building, "Worship Center II", is a long, tall, "center aisle" room with hard surface flooring throughout, sound reflective and diffusing reinforced gypsum board walls, and a metal ceiling deck that features sound reflective "clouds" above the Chancel and Choir spaces. 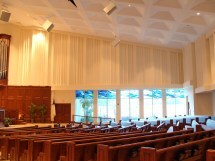 Speakers are carefully located and aimed to deliver speech to the congregation seating area, but to avoid unwanted sound reflections from other building surfaces. All A/V sytems were designed by Dave Hosbach of DSH Audio-Visions. The rear wall of the room is equipped to contain a retractable curtain so that the room's reverberation period can be altered and "tuned" to accommodate light attendance, or occasional contemporary music use. 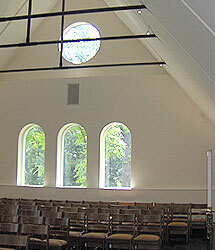 The maximum Reverberation Period in the room is slightly above 2.0 Seconds, achieving excellent conditions for congregational singing, choral and organ music, and for speech clarity. The 50+ voice choir is seated in the chancel on tiered hardwood risers that have interior treatment to suppress foot-fall noise. Twin organ chambers flank the center Chancel window. The First Presbyterian Church of the Covenant is a Gothic style structure, built in 1930. Walls and floors are of stone, but the original ceiling was constructed of perforated metal panels with sound absorbing fibrous backing. The reverberation period was lower than desired for choral and organ music, and robust hymn singing. A previous attempt to reduce the sound absorbing effects of the ceiling failed when the canvas sheets glued over the perforated panels delaminated and fell. All sound absorbing ceiling panels have now been replaced with reinforced and rigid gypsum board inserts. The result is an increased reverberation period, especially at low frequencies, that enhances the full range of music and hymn singing. Choir singers have also been re-oriented into an "ensemble" seating arrangement at the front of the room, with space for instrumentalists in the now flexibly furnished Chancel. There are new wood sound reflector-diffusers installed behind and beside the singers; these reflector-diffusers are designed to match the architectural style of the room's existing original wood features. The previous sound system provided poor speech intelligibility and room coverage. The new system has multiple visually discrete "line-array" column speakers that are "zoned" to deliver clear, intelligible speech to all seating locations. The new sound system is all digital in its operation, having a large mixing console with pre-sets for simplicity of operation. Its capabilities include full speech reinforcement, light music reinforcement, and recording. A video system has been prepared to have record and projection functions. St. Peter's Catholic Church is a large scale Greco-Roman Basilica style building with an acoustic environment that did not support liturgical Catholic worship. The reverberation period was too low to enhance music or to encourage participation by the assembly in sung and spoken Mass parts. The "dead" and dull acoustic ambiance did not match the vibrant decorative style and grand visual scale of the room. 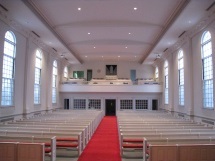 The nave's previous interior finishes included carpeted aisle and under pew flooring, with marble flooring only in the Sanctuary. The barrel vaulted ceiling was entirely clad in sound absorbing acoustical tile. Highly decorated and detailed walls were hard plaster however. 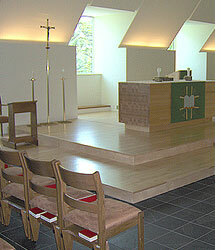 Use of hard surface flooring throughout the nave and sanctuary, including spaces in aisles and under pews, to increase the Reverberation Period for the benefit of traditional music styles, and to facilitate the assembly's participation. Replacement of the sound absorbing acoustical ceiling tile with hard plaster coffered and sound diffusive treatments to enhance the reverberation period, and to be appropriate to the architectural heritage and style of the room. The placement of modest sound absorbing cloth covered fiberglass treatments at rear and side wall regions in the space to "fine tune" the reverberation period, and to prevent unwanted flutter and echo reflections. The cloth covers are dyed to match the plaster paint colors, for the purpose of blending seamlessly into the architecture of the space. 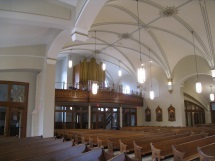 The growing and vibrant music program of the church generated the need for additional and flexible space to accommodate the parish's many musical ensembles which include full choirs, bell choirs, and instrumental ensembles. Further, a larger, durable and reliable organ, with sufficient musical resources to lead the sung liturgy and support and accompany a variety of musical styles was desired. Acoustic improvements to the room include the use of hard surface flooring throughout along with sealed and hardened wood surfaces, and multiple layers of dense, sound reflective wall materials. The balcony was enlarged with a cantilever overhanging only two rear of nave pews. The balcony also now has a sound transmitting wood baluster railing. 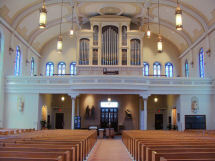 The desire for an improved acoustic environment at St. Mary of the Hills Church was occasioned by the church's purchase of a new Lively-Fulcher pipe organ. The English cottage style building had a too low Reverberation Period for the enhancement of music rendition or for the support of the congregation in sung and spoken liturgy. The room is not large enough, or with sufficiently tall walls to achieve a truly "live" reverberance, but it was also not functioning at its maximum potential. 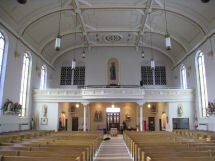 Primary challenges were the thin finish wall material, the unsealed softwood ceiling deck, and the presence of heavy wood trusses that obstructed sound distribution down the Nave. 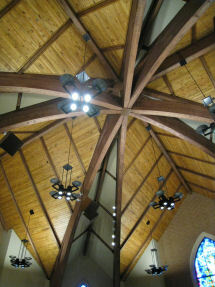 A related but separate issue was the partial bowing of side walls from the weight of the roof truss structural system. 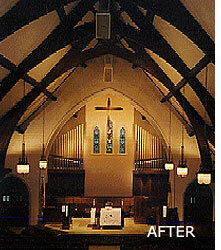 Acoustic renovations included the hardening and sealing of the wood ceiling deck, the stiffening of side walls with double layers of gypsum board, and the replacement of the roof trusses with those of reduced girth and higher mounting in the overhead space. Further, walls and ceiling in the organ case/chamber and choir areas were strengthened with three layers of glued and fastened gypsum board to reinforce and reflect musical sound energy. 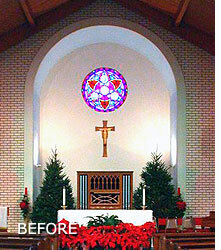 Discrete ceiling mounted reflectors were also placed above the Choir to project tone down the long nave. 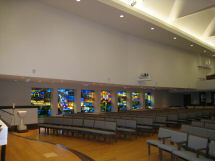 Insulated and laminated glass was specified to attenuate the noise of exterior mounted HVAC equipment from transmitting into the worship space. 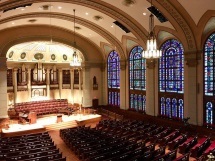 Before the building renovation and new organ project, First Presbyterian Church, Birmingham suffered from a common American acoustic defect; a too low reverberation period caused by the presence of sound absorbing carpets and wall panels. Further, music rendition was poor, due to the side oriented organ chambers, with sound trapping side passages adjoining the Chancel. 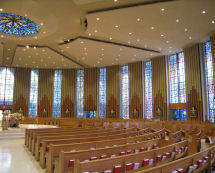 The smooth, curved ceiling form also created sound "hotspots", tonal focusing, and "echo" type effects. Acoustic re-design features include all hard surface flooring, sound reflective and diffusing wall surface treatments, and coffered ceiling reflectors. Choirsingers now have tiered risers in an ensemble "horse-shoe" format to facilitate tonal blend and projection. Chancel walls are angled and detailed to blend tone and direct reinforced musical sound toward the nave. All interior surfaces are hard and structurally dense to assure reinforcement of sound energy across the full frequency range. 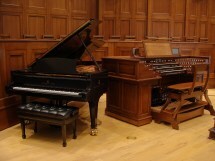 The new Nichols & Simpson organ is encased at the front wall of the room, such that both choir and organ sing from the end of the long axis of the space. 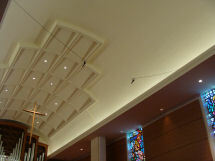 Custom designed wind ducts were installed to deliver nave temperature make-up air to the organ blower, while preventing blower noise from being heard in the worship space. The sound system includes line array speakers, selected for their ability to provide speech clarity in the room with a now generous reverberation period. The system also has full recording and playback capabilities. This new building, of historic Gothic inspiration, but constructed of entirely modern materials, has arches, columns, vaults, transepts, and clerestory windows. The architects designed a steel superstructure, and clad it with pre-formed and composite newly developed materials. Our acoustical task was to create a very classic room for natural, non-electronically reinforced choral, organ and instrumental music with a generous, even, and warm reverberation period. This was achieved with the use of primarily hard, dense, sound reflective and reinforcing materials and treatments. Hard composite material finishes, multiple layers of dense wall components, sealed surface textures, and diffuse, multi-faceted surface forms and profiles were employed throughout the space. Hard tile, wood, and brick flooring, along with closely spaced structural framing, angled and diffusive wall and ceiling geometries have all been incorporated into this classically styled new building. Further, the building is fully equipped with state of the art sound and video system components. 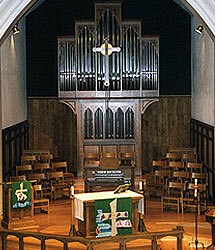 The nave's sound system delivers clear, intelligible speech to worshippers in every corner of the vast, live room. 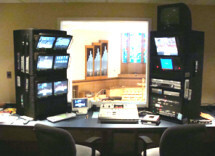 Complete sound and video recording, mixing, and broadcast technologies have been provided to facilitate the many media based education and ministry programs of this dynamic congregation. Harvey Browne Presbyterian Church was a basically functional worship environment, but lacked adequate flexible space for musicians and worship leaders. Further, the room suffered from uninspiring acoustics that did not enhance music or hymn singing participation. 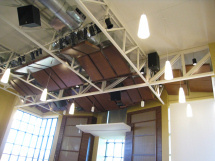 Side wall and ceiling wood trusses obstructed tone projection, while carpeted floors and the softwood ceiling deck absorbed important sound energy. The remodeled space includes hared floor surfaces and sound reflective and diffusing reinforced gypsum board diffusers added between the ceiling trusses. 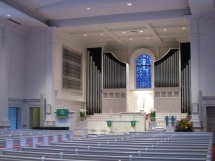 Real sounding facade pipes were added to the organ, and the Chancel music and liturgical space is enlarged with flexible furnishings. 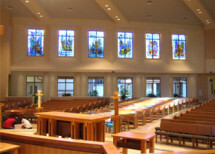 "We want our new church to 'look like a church'"; this was one of the primary design parameters that governed Groth Design Group Architects in the planning of the new  large St. Jerome worship space. Indeed, this traditionally styled and proportioned room, outfitted with modern technologies, is a modern "classic". Columns, colonnades, rose windows, and tracery abound. 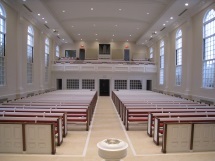 The hard surfaced paint stenciled walls and ceiling, and herringbone pattern marble floors result in a "live" acoustical environment that encouraged congregational song. The traditional upper rear choir loft and encased Berghaus electric-slider wind chest organ facilitate a creative liturgical music program. 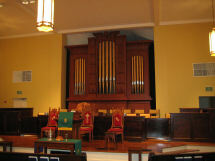 The organ also features an Antiphonal division at the Sanctuary for small group and Cantor accompaniment. The sound system has multiple speakers nestled amongst ceiling trusses, aimed to delivery clear speech to all seating locations. 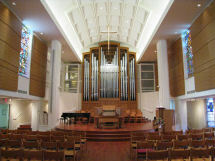 The Martin Luther College Chapel has been designed to serve many and various campus functions. Primarily, it is the main site for Worship, but concerts, lectures, symposiums, and a variety of other college events happen within the space. 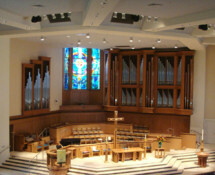 A large encased Schantz pipe organ is placed just behind the tiered choir risers that are embraced with sound reflective and diffusing "band shell" type walls. 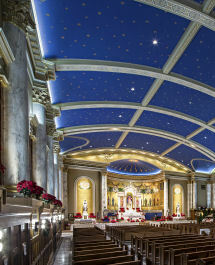 Musical and liturgical sound is reinforced and enhanced by the generous reverberation period (above 2.0 Seconds) that results from the stiffened gypsum board walls and ceilings, along with hard tile flooring. Sound diffusing wall profiles and wood wall insert details diffuse reflected tone to become both balanced and enveloping. The selection of structural features and materials, and the design of the mechanical systems prevent interruption from unwanted background noise. Keys to the acoustical success of the room are its large cubic air volume, "long axis" location of choir and organ, and use of hard, dense, sound reflective materials, all within a modern expression of classic architectural forms and principles. Moorings Presbyterian congregation has built an inspiring all new worship space. The former building, with low ceilings, carpeted floors, and an imitation organ, lacked the dynamic vitality that the new room exemplifies. 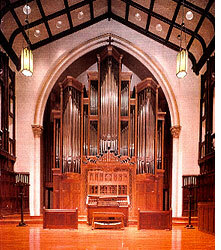 The new Nichols & Simpson organ is placed in commodious chambers with encased facades on the long axis of the room. The James Boughton architects seamlessly integrated sound reflective and diffusing forms into the architecture. There are only modest areas of carpet, with all other surfaces hard and sound reflective. The resulting over 2.0 Second reverberation period enhances music and supports clear speech via the ceiling mounted, distributed speaker sound system. Attendance rates during worship vary significantly across the year, due to the influx of "northern snow birds" during the high season. Therefore, retractable sound absorbing curtains and alterable sound system programming can shift the room's acoustical environment, depending on the occupancy rates. 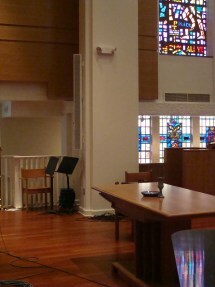 The all new worship space at St. Andrew's Lutheran Church is a traditionally conceived space; long, tall, narrow, cruciform, with a "center aisle" congregational seating layout. 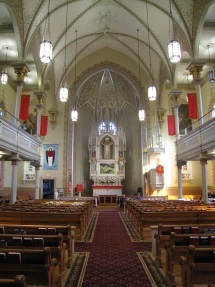 Choir and organ are located behind the Chancel and Altar at the front, on the long axis of the room. 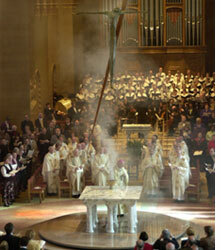 This classic room form and layout is ideal for traditional musical styles and liturgies. 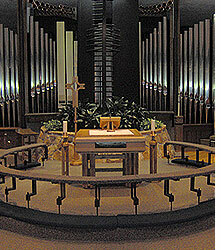 The re-purposed Aeolian-Skinner organ (from the former Episcopal Cathedral in Kalamazoo, Michigan) stands in a tall case, above and behind the choir singers. 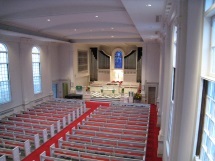 The choir area has ensemble oriented tiered risers, along with space for instrumentalists. Room finishes include multiple gypsum board layered dense walls for sound reflection and reinforcement. 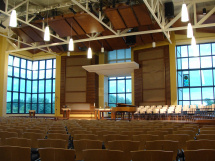 Hard surface flooring, a sealed, hard-wood ceiling deck, and discrete upper rear wall absorbers (to temper unwanted hard echo reflections) all combine to produce a reverberation period that enhances music and fosters robust participation in hymns and liturgy by the congregation. The extensive music program of the church called for a reliable instrument, capable of accompany and leading sacred music of many styles. 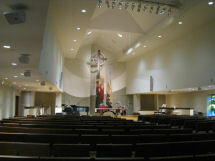 Further, adequate flexible and functional space and a supportive acoustical environment were necessary to the present and future goals of the church's music ministry. Acoustic improvements to the room include the use of hard surface flooring throughout along with sound reflective and diffusing, hard, dense wall and ceiling gypsum board and plaster treatments. 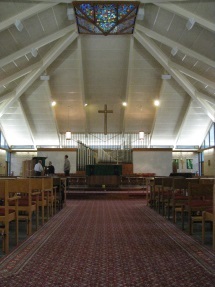 The Chancel and choir area were enlarged by extending the space towards the nave. The Chancel now accommodates all liturgical functions as well as provides space for choir singers, the organ console, a grand piano, and other instrumentalists. Modesty railings are spindle/baluster type to allow unobstructed sound projection. Access is facilitated with a chair lift. 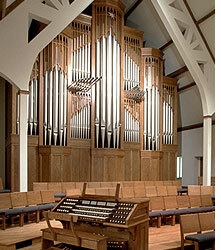 The new Glück organ is located in twin chambers at the front and sides of the Chancel. The primary divisions are on the long axis of the room, in cases/chambers that flank the central Chancel window. 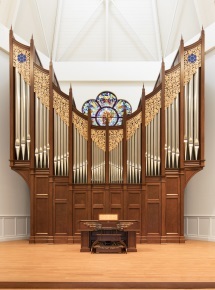 The casework and façade blend into the architectural style of the room, and the expression chambers are finished in multiple layers of dense, sound reflective gypsum board, with both insulation and air circulation fans to stabilize tuning/temperature conditions for the organ. The organ action is electric with some unit actions. The movable side-jamb stop tab console has a complete multi-level combination system. 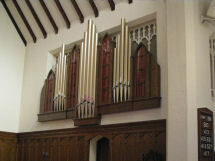 The organ employs some restored and rebuilt pipe work from the previous Mayflower Church organ, along with re-purposed pipes from Glück stock, as well as new ranks. 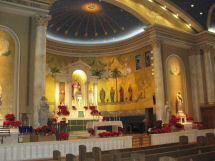 St. Hedwig church is set in one of the oldest neighborhoods in Milwaukee, WI. The building dates at over 100 years old. 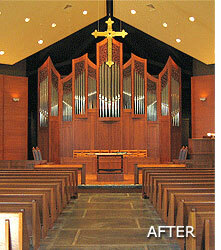 Over time the worship space interior and organ have been remodeled, updated, redecorated, and rebuilt many times. The instrument and room were far from their original artistic and architectural inspiration and intent. 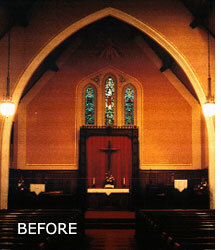 The parish desired a restoration and return of the building to a more historic style and period. 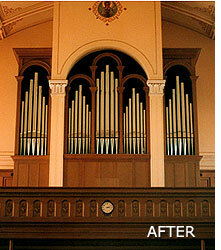 The organ was a significant factor in returning to the historic integrity of the room. 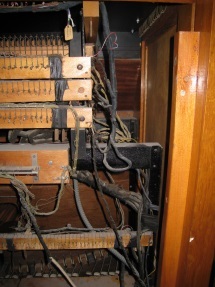 In 2006 we found the organ to be failing... mechanically, electrically, and structurally. 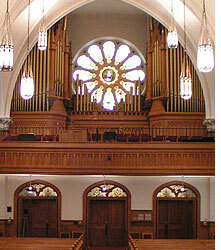 Considerable portions of the original Kimball instrument remained, but over time the organ had been removed from its original case,changed to electro-pneumatic action, and positioned into two chambers at the back of the balcony that obstructed eight art glass windows. 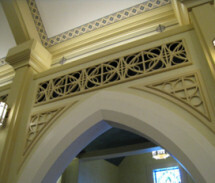 The project goals therefore included returning the organ to a traditional encased position at the center of the balcony, thus allowing the art glass at the rear of the former chambers to be revealed. 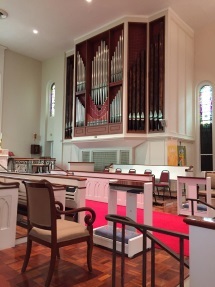 Happily, the Holtkamp organ company had available a modestly sized existing instrument available that could be repurposed into St. Hedwig Church, with the best portions of St. Hedwig's Kimball organ available to be combined with the Holtkamp organ. 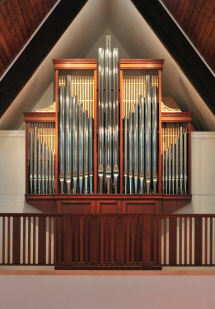 The result is an instrument that contains the bright clarity of the newer Holtkamp organ, along with the rich sonorities of the Kimball pipe-work. All of this has been combined on new act electric slider actions for superb reliability and tone, with pipes fully re-voiced into a noble, clear, broad palette of tone. Further, the Holtkamp console from the Julliard School of Music in New York was available for sale, so this console now controls the instrument. A classically styled case, evoking the architectural idioms of the St. Hedwig room, provides both an artistic visual effect, and a blending tonal effect. The First Presbyterian Church, built in 1837 in Gallatin, Tennessee, was severely damaged by fire in December of 2004. The fire, begun from a Christmas decoration candle on a window sill, burned up the side wall of the church, across the ceiling, into the organ chamber, and through the roof of the building. While partly damaged, the Egyptian Art Deco styled organ case survived the fire, along with some pipes from the electro-mechanical organ. The new mechanical action instrument, built by Bradley Rule of New Market, Tennessee, has electric stop controls and a detached console. Room acoustics were enhanced with a coffered detail on the ceiling, reinforced gypsum board walls, and a reduction in the amount of carpet in the space. 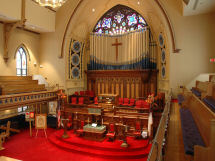 The Salem United Church of Christ, Quincy, Illinois, has a Victorian Gothic structure built in 1876, featuring a "wrap around" balcony, with choir and organ elevated at the front of the room. The old Moller organ, worn and decayed, was installed with extremely challenged access and maintenance space into three chambers. 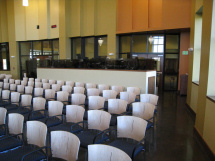 Choir seating, while well placed, was fixed and inflexible in a "stadium" arrangement of theater chairs on carpeted floors. 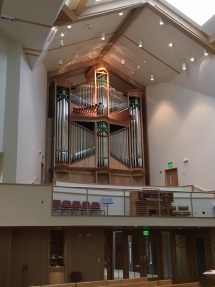 The new Schantz organ, having more ranks than the previous Moller, is accessibly installed into the chambers, with the historic façade pipes retained. 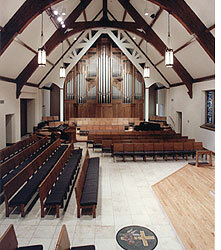 The choirarea, with the movable organ console, now features portable chairs and risers with hardwood flooring. 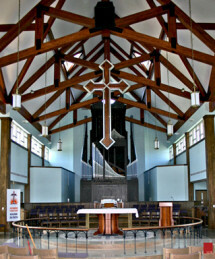 The St. John Lutheran Church building is constructed in the "A-Frame" style, with organ and music ministries functioning from the rear gallery. The congregation's musical offerings include traditional liturgie swith organ, choir, bell choir, and other vocal and instrumental groups. 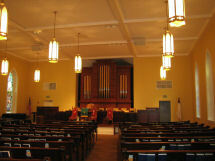 Community musical organizations also use the church as their performance venue. Originally, the music gallery had an unsealed, soft-wood ceiling, carpeted floor, and "soft" sound absorbing acoustic spray material on the rear wall. 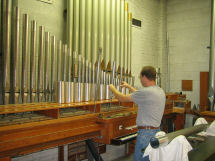 The former electro-pneumatic pipe organ was composed of a variety of used and newer components, and was inadequate, both musically and mechanically. The new Berghaus organ has electric slider main chest action, with some unit chests. 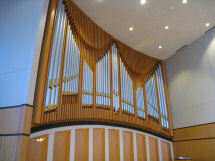 The fully encased instrument sits at the center-rear of the balcony, on the long axis of the room. 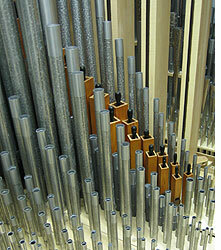 Three ranks of pipes were restored and re-used from the church's previous organ. The movable console is outfitted with a multi-level combination action as well as player conveniences such as "Automatic Pedal" and "Melody Assist" features to aid pianists. 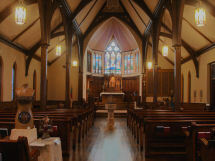 Christ Episcopal Church has a classic, traditional worship space with a long center aisle, Apse and Chancel, and a lofty peaked and arched ceiling. The Tiffany windows and Victorian Gothic style of the room increased the building's inspirational setting. The primary acoustic deficit was a too low reverberation period caused by the presence of large expanses of carpeted flooring. 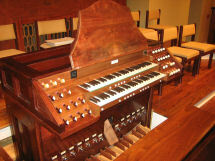 The organ was suffering from the effects of dirt and age to the pipes, leathers, and electrical switching system. 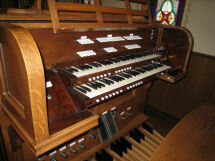 The organ was cleaned, repaired, and restored, with a new multi-level solid state switching and combination system retrofitted into the historic, and now movable console. The P.J. 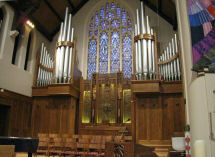 Swartz Organ Company of Eatonton, GA has recently completed the rebuilding of the 1969 Verlinden organ at Christ Church UCC, Milwaukee, WI. Technical, mechanical, and tonal revisions and updates were accomplished. 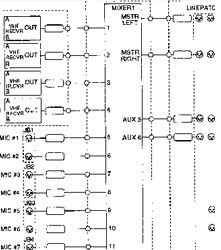 These include the replacement of the aging electro-pneumatic switches with a new Syndyne solid state control system that offers an expanded combination action as well as MIDI capability. Trumpet pipes were replaced with a new rank for improved scaling and tonal blend, along with a 16' extension into the Pedal. The original Vox Humana was also replaced with an historic Wangerin Oboe to expand the organ's tonal palette and functional use. Finally, a 4' Swell Principal rank was added, particularly so that the unification of the Great Diapason stop could be reduced. 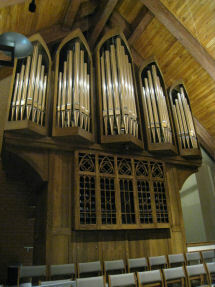 When originally installed, the main windchests of this instrument were mounted within the chamber, higher than the top level of the tone opening. 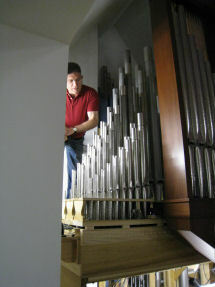 From this position, no tone from pipes could project directly through the grille opening to the nave of the church. 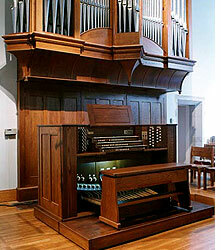 It is speculated that this "too high" mounting of windchests by the original builder above the tone opening was caused by the tall pneumatic switch stacks that were located beneath the windchests. 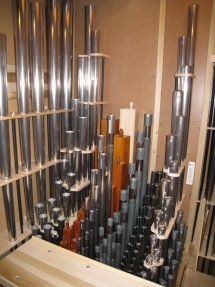 With the introduction of the solid state switching system, the tall pneumatic switch stacks were removed, and the windchests lowered to bring pipes even to the tone opening level. The result is a renewed tonal vitality, presence, and projection. 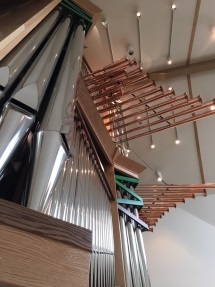 The repositioning of the organ pipes for good tonal egress, along with the replacement of carpeted worship space flooring with polished granite, has resulted in an excellent musical and liturgical functional space. Scott R. Riedel & Associates Ltd., Milwaukee, WI, provided consultation service to the project. 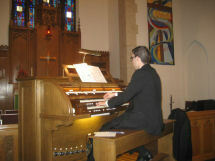 The dedication recital was performed by Donald VerKuilen on Sunday November 13, 2011 to a capacity crowd. 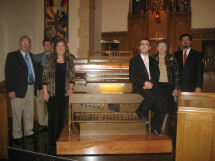 The Berghaus Organ Company found, restored, re-configured, and installed an historic Casavant organ, re-voiced to fit into the new setting. 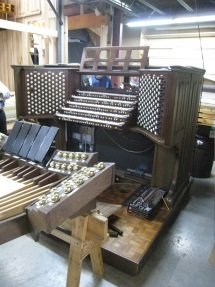 Due to structural challenges in the building, the primary divisions of the Casavant-Berghaus organ (Great, Swell, Pedal) are installed into the rejuvenated Chancel chambers. 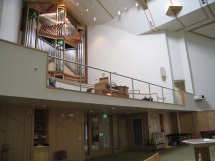 An expressive Choir division composed of some ranks and components from the church's previous Estey-Berschdorf organ is installed in an updated balcony chamber. The Pilgrim Church building is designed in the Victorian Gothic style. There is a tall, long central nave, with twin transepts flanking the crossing. 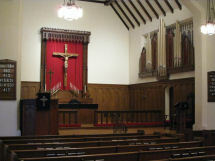 Originally the Altar was at the front wall of the Chancel, with choir singers facing each other in the Anglican manner. 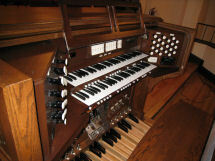 The original Wangerin organ, of primarily unit stops, was installed in a left-front chamber with tone openings only into the Chancel. 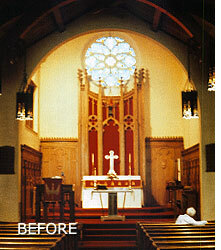 Building and acoustic modifications include a Chancel extension toward the Nave crossing, with a central, free standing Altar and movable liturgical furniture. The choir is now located on tiered risers at the front wall of the Chancel, on the long axis of the room. All Chancel and choir flooring, formerly carpeted, is now finished in sound reflective hardwood. 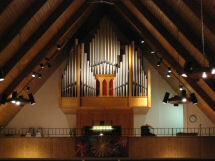 The re-purposed organ was originally built by the Schantz Organ Company in 1958 for the Community Reformed Church in Holland, Michigan. 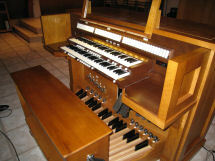 Changing worship styles at the Michigan church caused the organ to be sold. The organ was re-designed and installed by the Berghaus Organ Company to have the Great division in twin cases flanking the central Chancel window. The Swell andPedal divisions are placed in the former organ's Chancel side chamber. The chamber has been remodeled for improved tonal projection and to have an expressive Swell chamber separated from the non-expressive Pedal stops. 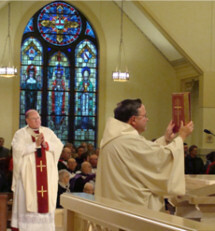 Wind pressures were increased, and the organ was re-voiced to serve its new Lutheran liturgical and architectural setting. 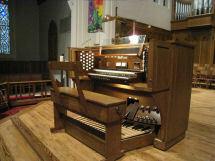 The three-manual draw-knob console is movable to accommodate flexible use and positioning in the Chancel. 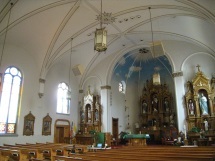 The well proportioned architecture of St. Mark's Lutheran Church suffered from a poor acoustical environment and an inadequately placed, decaying organ. The room contained both sound absorbing carpeted floors and a porous ceiling. The divided Chancel choir seating arrangement restricted musical flexibility. Worn out organ pipes and parts from various sources were trapped in a deep side chamber with restrictive tone openings. 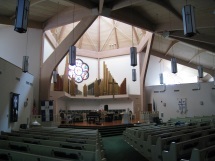 The unique architecture of this church created a challenge to achieving a typically desirable acoustical environment. The low ceiling height with exposed structure, overall circular geometric form, and angled glass perimeter wall do not facilitate a "live" reverberant space. The steeply sloped carpeted floor, diminutive structural elements and open ramp circulation halls further diminish the acoustical presence. The lack of a designated choir/instrument area with a flat floor also limited the flexible use of the space. The undersized and failing organ was installed into a chamber behind the altar, with some portions placed within closets reclaimed from adjoining offices. While a "live" reverberation period cannot be achieved within a building of this geometric form, improvements were achieved. Sound energy is now projected evenly throughout the room, and absorption diminished. The ceiling deck was refitted with sound reflective decks to close off the sound-trapping exposed structure. 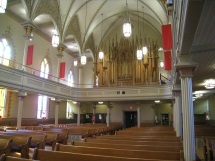 Some regions of carpeting were converted to hard flooring, and sound reflective and diffusing wall sections were built adjoining the choir and organ spaces. 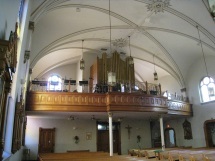 A dedicated choir and instrument space with tiered floor levels was also built. 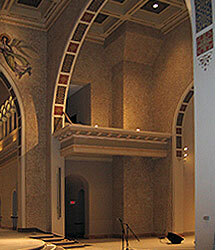 A functional organ chamber, composed of reinforced gypsum board walls and ceiling, was also provided. 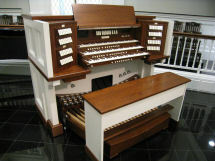 It is large enough to contain a suitable organ, and configured to reflect and project tone into the nave. The Buzard Organ Company provided an electric slider action organ for the room, voiced to blend tone and built to blend into the multiple curved architectural geometries of the room. Because of the size of the chapel and the need for maximum versatility, we decided to put both Great and Swell under expression. Since the bass pipes of the Open Diapason would not fit comfortably in the Swell box, we placed them in display but provided two separate knobs to draw the Open Diapason in order to avoid the problem of a big break in loudness at tenor C should the box be closed. The firm bass of the Lieblich Gedeckt serves well to underpin the Open Diapason when it is played under expression. 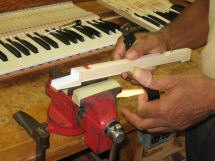 The extended 16' flute stop is made of four different types of pipes. Given the size of the room and the chapel's musical requirements, we decided that a celeste to the Dulciana (Unda-Maris) would be more useful than a narrow unison string. 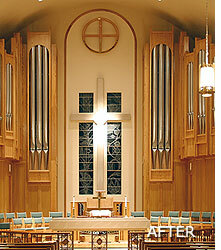 "Our goal was to provide an instrument and liturgical / acoustical environment which would provide for more devotional, inspirational, and exciting worship. 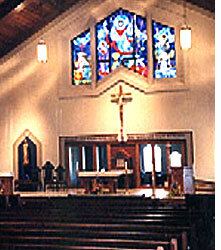 This building, of commodious original design integrity, now offers an even fuller, richer service to the congregation. 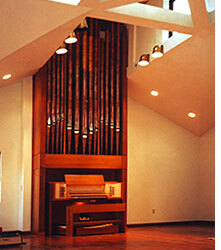 The resonant organ case has been built of historical wood cabinetry, blending with the visual design of space. The location of organ pipes on the front central axis of the room now allows blended tonal projection, balanced to the acoustics of the room. The acoustical environment itself has been 'brightened' with more sound reflecting surfaces, giving improved reverberance for organ, choir and congregational singing. Martin Luther's concept of a central altar table, closer to the congregation, has been achieved fro more intimate and communicative liturgy. 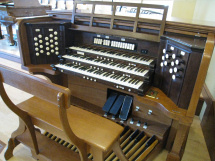 The mechanical action 'tracker' organ, now enhances worship with warm and clear tone; it will do so for many generations due to its long lasting design and workmanship." 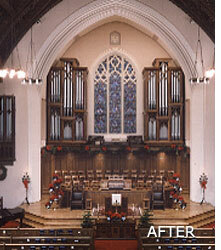 The old organ suffered from the effects of deteriorated leathers, a failing electrical system, and damaged pipe-work. 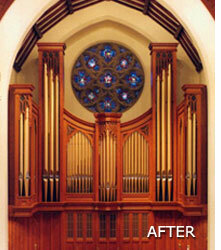 The "new" organ retains the historic casework, some of the older façade pipes, and many restored interior ranks. The remaining façade pipes have been built to blend with the historic façade, and new, durable slider windchests, solid-state electrical systems, and a movable draw-knob console have also been provided. This handsome building contained an excessive amount of sound absorbing material in the form of fully carpeted floors and a "celotex" ceiling deck. 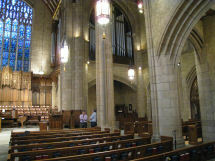 The choir and aging electronic organ console were located in a sound restrictive side transept, with the organ speakers in chambers flanking the altar. 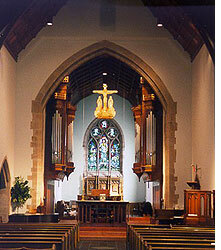 The previous chancel design of this church featured an organ buried in deep chambers. 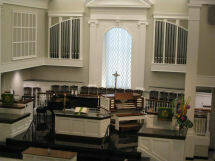 With the renovation of the sanctuary, the opportunity was available to improve the organ's location. 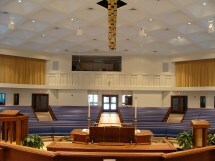 The altar and pulpit were moved closer to the congregation, and a new choir seating area was created. 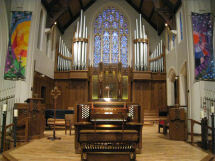 The organ is now located in shallow chambers and matching casework on either side of the chancel. The acoustic problems of this church were addressed in a unique manner. Through cooperation with the architect and contractor, the structure of the ceiling was made more reflective and dense through the use of a special expandable insulation. New slate flooring was also installed. The result is a space that is excellent in its support of liturgical participation and the grand "English Cathedral" sound of the Harrison & Harrison Organ. The two matching oak cases, bracketed out on either side of the chancel, were designed by Didier Grassin, suitably echoing the nineteenth-century work of the English designer and organ builder Dr Arthur Hill. 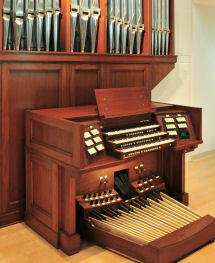 The south case contains the enclosed Choir Organ; the remainder is all within the north case, including the copper Orchestral Trumpet on 10-inch wind pressure. St. Peter's United Church of Christ is a building of worthwhile size and proportion but certain features compromised the acoustical space. The ceiling was made of sound absorbing acoustical tile and the floor was covered primarily with carpet. 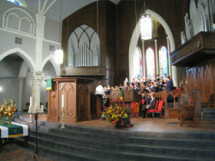 A divided chancel choir seating arrangement did not the meet the needs of the church's various vocal and bell choirs. The previous organ was located in a right side chamber that did not project sound directly into the nave. While much of the pipe work was valuable, the electrical and pneumatic (leather) actions were decaying. The Seminary Chapel is located within a larger old-world style campus structure, reminiscent of the Luther Wartburg Castle, in Germany. 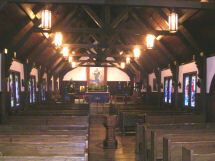 The Wisconsin Chapel was a long narrow room, with a truncated ceiling height and traditional long center aisle pew arrangement oriented toward a small chancel niche. An encased mechanical action organ by Martin Ott was at the rear of the room. 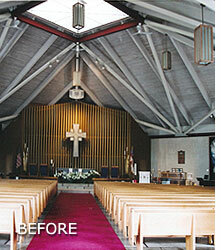 The award winning renovations included significant acoustical improvements based on our recommendations. These are a raised ceiling height, fulfilling the interior air volume to the full peaked (former attic) ceiling. 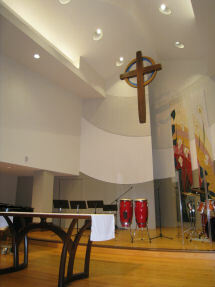 Hard surface quarry tile flooring, sound-diffusing plaster wall details and concealed sound system speakers facilitate speech, music, liturgical participation and liturgical/homiletic instruction in the space. The Martin Ott organ was relocated to the opposite long axis end of the room along with sufficient space for a grand piano and chapel choir. 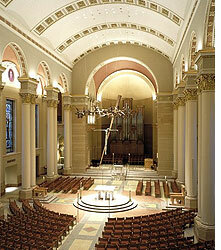 Nave chair seating is now gathered around a spacious central altar platform area that can be flexibly oriented. HGA Architects of Milwaukee, WI were the project designers. The original St. Anthony Church, a traditional long and narrow Gothic Revival stone structure, was outgrown by the large congregation. Portions of the original building remain in use as the “gathering space” for the otherwise new edifice designed by HGA Architects, Milwaukee. 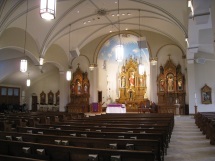 This expansive environment still maintains a traditional mode with a room that is longer than wide, having a central aisle orientation to the altar space. A curved wooden suspended ceiling form, reminiscent of a baldachin, is carefully detailed to provide necessary sound diffusion and modest absorption to control excessive reverberation. Sound diffusing stone and plaster walls complete the acoustical environment. The line array speakers are concealed in the front wall of the room. This cruciform shaped building formerly had significant amounts of thick carpeting throughout, a smaller chancel area and a small rear balcony for organ and choir. The reverberation period was low, speech lacked clarity from the sound system and musical sound from the rear balcony did not travel well to the deep forward transepts. 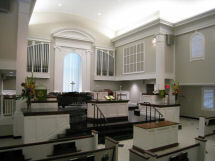 The growing music ministry program at the church, along with the desire to improve the quality of worship and music, facilitated the renovation of the worship space. 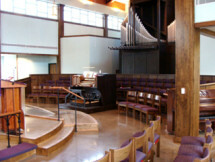 A large, tiered choir seating array along with a spacious plaza for bell choir and instruments has been built at the front of the room. 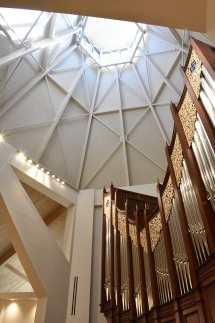 The new Goulding & Wood pipe organ is installed within a chamber at the end of the long axis of the church, above and behind the choir/music space. Hard, sound reflective flooring has been installed, along with sound diffusing transept wall features and transept corner details designed for sound distribution throughout the room. 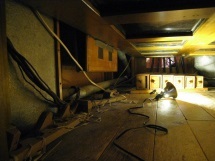 New sound system speakers are recessed into the ceiling deck. 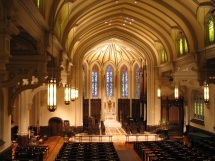 This Cathedral, designed in the Romanesque Style, was built with significant amounts of sound absorbing materials applied to the entire ceiling deck and upper clerestory walls. The reverberation period was too low and sound poorly distributed. 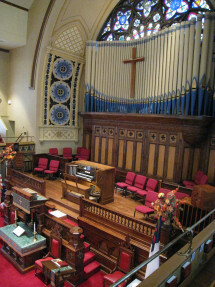 The choir sang from a difficult to access rear balcony, and the organ was a pipe/electronic combination instrument, also located in the balcony. 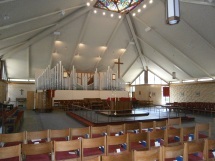 Liturgical renovations included the relocation of the main altar to a raised platform nearer the front row of worshippers, and moving the choir/music ministry out of the balcony to the front of the room. 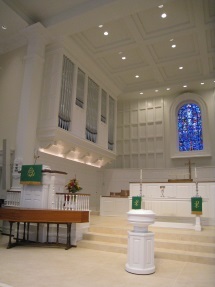 A new, tiered choir riser system is installed at the front right transept near the altar. The sound absorbing ceiling and upper walls are changed to be sound reflective, with the building’s reverberation fine-tuned with the installation of modest sound absorbing features at the upper rear wall of the room only. The line array sound system speakers, discretely mounted on vertical building columns, deliver speech to all seating locations. 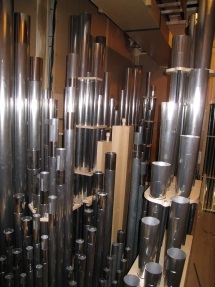 Organ chambers have been created at the upper forward clerestory level of the room, near the choir seating area, in preparation for the installation of a future pipe organ. 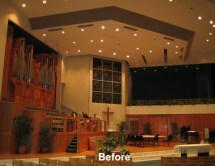 This project involved the acoustical fine-tuning of an already existing space. 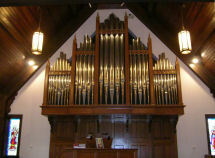 The church had previously contracted with the Schoenstein Organ Company for two new instruments in the chancel and gallery, respectively. One of our goals was to eliminate echoes, hot spots and other acoustical oddities in this already reverberant space. The solution involved careful design of wall surface profiles to control echoes. Another requirement was to enhance the projection of the organ from the large chancel chamber. Special wall and ceiling profiles, and dense plaster materials were employed. The Chapel at the National Shrine of Mary, Help of Christians, Holy Hill, Hubertus, Wisconsin serves the local monastic community and is a place of pilgrimage, receiving thousands of visitors each year. The building is a large, traditional Gothic structure built of sound reflective plaster and marble materials. The reverberation period in the space exceeds 5.5 seconds, so a new sound system was designed using a line array speaker configuration to bring speech clarity to this very "live" room. 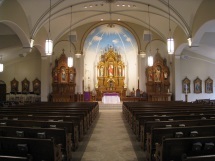 This long-time home of the world famous St. Olaf Choir underwent a liturgical and architectural renovation that included a reoriented liturgical center, new interior finishes, a new organ located at the front of the room, and a new choir plaza. 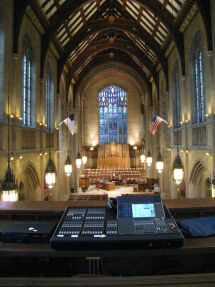 We designed a new sound system that employs two line array speakers to serve the large first floor of the nave. Additional speaker coverage was designed for the rear balcony, along with state of the art recording and processing systems. 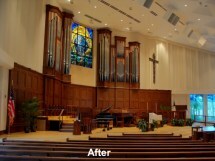 This project presented many unique design challenges to accommodate a dynamic African American style worship service. In addition to an extensive sound and video system to serve choirs ranging in size from 15 to 100, a highly resonant floor area in the nave was created to accentuate the singing and rhythmic dancing of the “Spiritual Choir”. The room shape has a long and tall geometry. Hard surfaces were employed throughout to create a resonant space. By using angular wall planes, parallelism was avoided. This will prevent unwanted echoes in the worship space. This project involved the renovation of an existing space. Before modifications, the church was excessively carpeted. 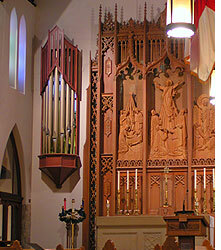 The old electro-pneumatic organ spoke from deep inside chambers across the chancel. 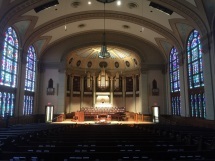 After the decision to purchase the new Letourneau organ was made, we were engaged to provide consultation for acoustical improvements. 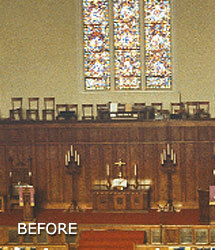 Carpet in the chancel was replaced with a hardwood floor. 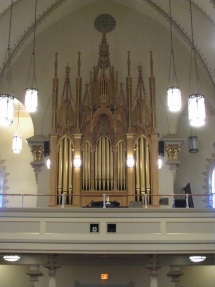 The organ speaks from a freestanding case down the center axis of the building. The old organ chambers were sealed with a sound reflecting / diffusing material. Acoustics in the Worship Space I - "Form Follows Function"
Acoustics in the Worship Space II - "Planning for the Future"
Acoustics in the Worship Space III - "Purpose & Design"
Acoustics in the Worship Space IV - "Carpeting"
Acoustics in the Worship Space V - "Echo"
Acoustics in the Worship Space VI - "Padded Pews"
Acoustics in the Worship Space VII - "Can't microphones fix any acoustical problem?" Acoustics in the Worship Space VIII - "A Church is not a Concert Hall"
Acoustics in the Worship Space IX - "The Value of Good Acoustics"